Air New Zealand says a technical issue affecting check in for flights worldwide has now been resolved. The airline said earlier this morning said it was "actively investigating the cause and a further update will be provided when more information is available". A new release just through says "Air New Zealand has resolved the technical issue which affected check in for flights earlier today. 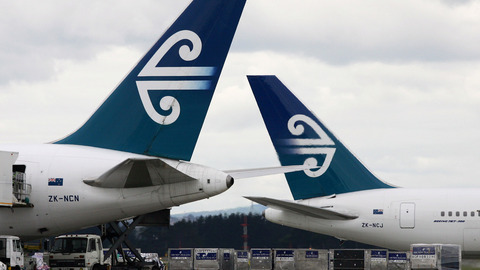 Air New Zealand thanks customers for their patience while it has worked to resolve the issue." An Auckland Airport spokesman said there had been "very little impact on Auckland Airport's operations as a result of the technical problem." Manual check-in was still available at airport counters however customers were told they "may experience delays checking in for their flight and are advised to allow more time to complete check-in until the issue is resolved." People travelling at Auckland Airport said on Twitter there had been long queues for the manual check in counter. The queues were completely clear by 10am, with some jet setters expressing relief they weren't caught up in the wait. One couple traveling to Perth said they did not have to wait at all. They did not see the queues. "We just missed it apparently, the Air New Zealand woman just told us. "We're lucky. You don't want that when you're flying." Two Air New Zealand staff members were helping the handful for remaining passengers check in at machines. The rest of the check in area - including about 50 self check in stations - was clear of waiting passengers. Carole Wilson and her family had left plenty of time to get to the airport from Orewa for their afternoon flight today. She said she had not heard about the queues but was happy they missed them. "Very lucky we came early," she said. "The traffic was way back at Oteha as well but we just flew by in the bus lane." An Air New Zealand employee, who was working during the rush, said there was not too much delay for passengers. The manual check-in system was able to get passengers through just as fast as the self check-in systems, he said. There was a small queue as people realised the self check-in machines weren't working but it cleared fast, he said.